It is difficult to pick the best week for spring birding in southern New Jersey. Having lived in the Southwest for over three decades, I longed to see the flocks of warblers, Rose-breasted Grosbeaks, Scarlet Tanagers, vireos and orioles that I remember from my childhood. The first two weeks of May used to be best for land birds in northern Jersey. The trees had barely begun to leaf out, and they were adorned with multicolored feathered beings that matched the little pictures in my skinny 1933 Peterson’s Field Guide. Their brilliance and sheer numbers sealed my fate as a bird watcher. Climate change has sped up the emergence of leaves and hastened the passage of spring migrants. Their numbers are also much lower now than I remember in the 1940s. 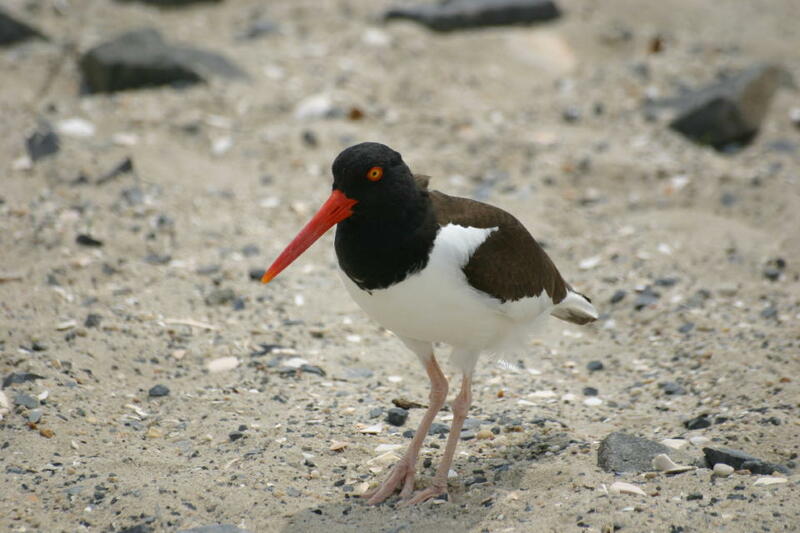 Shorebird identification can be challenging. Many look similar, and their colors and patterns seem never to match the plates in our various field guides. Since we have lived inland for so long, we have had few opportunities to observe them. To prepare ourselves, we purchased The Shorebird Guide, by Michael O’Brien, Richard Crossley and Kevin Karlson. This splendid book is chock full of vivid photographs that depict shorebirds in various plumage stages at different times of the year, and allow side-by-side comparison between similar species. It places great emphasis upon behavior: manners of vocalizing, flocking, flying, foraging and feeding, and even posture. We eagerly anticipated the new moon on May 16, when, during our participation in a birding Elderhostel at Cape May, the Red Knots and Ruddy Turnstones would time their arrival with the spring tides of the new and full moon. Horseshoe Crabs take advantage of the high water to deposit their tiny greenish eggs, four inches deep in the damp sand, just above margin of the lapping waves. 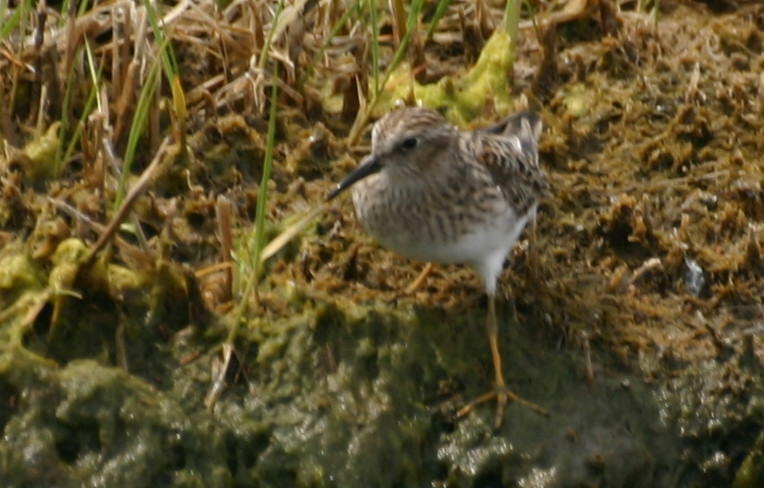 “Peeps,” as the smaller look-alike Semipalmated, Western and Least Sandpipers are known, join the more easily identified larger sandpiper species to feast on the crab eggs. During the first few days we practiced our shorebird identification skills as we explored the area north of Atlantic City. Great Bay Boulevard runs out of Tuckerton through tidal marshes to the Atlantic Ocean at Mystic Islands, just across Barnegat Bay from the southern tip of Long Beach Island. In the 1920s, before there was a Garden State Parkway, it was to have become a major highway connecting all points north to Atlantic City. Engineers encountered bottomless muck that put an end to their plans to run a causeway from the mainland to Brigantine on the barrier island, and the marshes that would have been drained and filled became part of the 5300 acre Forsythe National Wildlife Refuge. After crossing two narrow wooden one-way bridges crowded with fishermen, we traversed several miles with mud flats on both sides of the road. 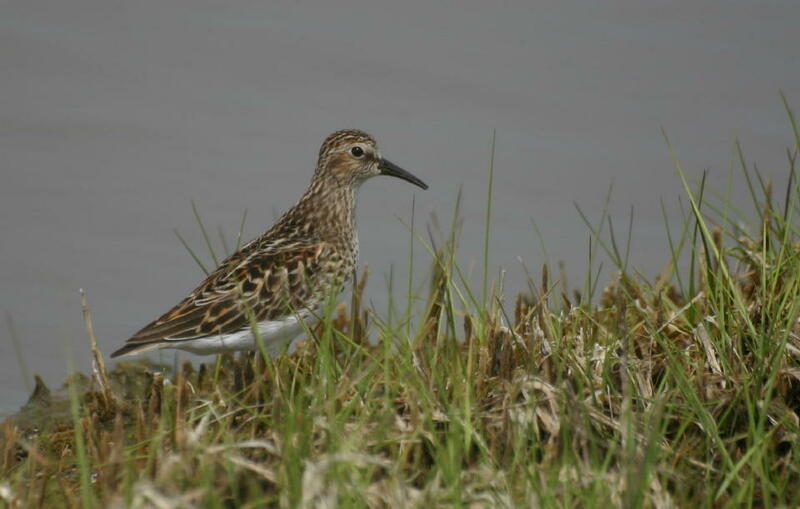 We saw good numbers of shorebirds. Linda Reddington, Lifestyle Editor from the Tuckerton Times Beacon stopped her car to photograph and talk to us as we birded the road, and then wrote this article with a picture of us (thumbnail above). As a Cub Scout, I longed to grow up into a full-fledged Boy Scout. I worked through the ranks—first the Bobcat pin, then the blue uniform and the Wolf, Bear and Lion badges… and finally WEBELOS, whose motto was a secret anagram made up of letters from each Cub rank. We were privy to its meaning: “We’ll Be Loyal Scouts.” Once I turned 12 and graduated out of the Pack and into St. Mary’s Rutherford Troop 8 my zeal faded somewhat, and I never made it to Eagle. However, I really enjoyed the hikes and the nature study. The highlight, and the finale, of my scouting career was the Historic 1950 National Jamboree in Valley Forge, Pennsylvania. It was only the second such gathering—the first, in Washington, DC, was to have celebrated the 25th anniversary of the scouting movement in 1935, but it was postponed until 1937 because of the polio epidemic. The event was awe-inspiring. The tents of 45,000 boys and their leaders filled the historic battleground. Insignias and patches were actively traded. After a couple of days nearly everyone’s uniform was unadorned, except for strands of various colored threads outlining where mothers had labored to affix badges and home town patches, formerly so proudly displayed. One emblem that I absolutely refused to trade was my hard-won white Klondike Derby patch. It celebrated my participation as a member of a team of “huskies” who pulled a homemade sled over a quarter mile course at Garret Mountain in the dead of a late 1940’s winter. Significantly, it was a particularly warm day and it had not snowed for weeks, so we dragged the contraption, or what was left of it, over mud, brush, gravel and rocks to a triumphant finish. No, I would not trade that badge for anything… well, almost. Eagerly, I anticipated bringing it home to New Jersey, to show all my friends and enjoy seeing how jealous they would be. We returned home late, but before bedtime I prepared a habitat for my new pet, a large glass bowl with sand and a rock. First thing in the morning, anxious to make the animal feel that it had returned to sunny Texas, I placed its enclosure out in the center of our back lawn, away from any un-desert-ly shade. He seemed happy and became quite active. The neighborhood kids were duly impressed, watching it bask in the noonday sun. I went into the house for lunch, then hurried back to see Tex. He was lying very still, probably enjoying the Texas-like climate, or so I thought. When Tex failed to respond after I poked him, I got worried. Mouth-to-mouth resuscitation had not yet been invented, but if it had I probably would have been puffing for hours. Hyperthermia was not then in my vocabulary, but that is what killed Tex. That marked the end of my scouting career. I never filled the vacant spaces on my uniform shirt, just didn’t have the heart. 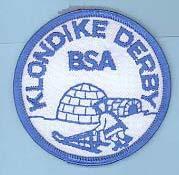 I still miss the Klondike Derby patch and wonder whether that sharpie from Lubbock will be selling it on eBay one of these days. 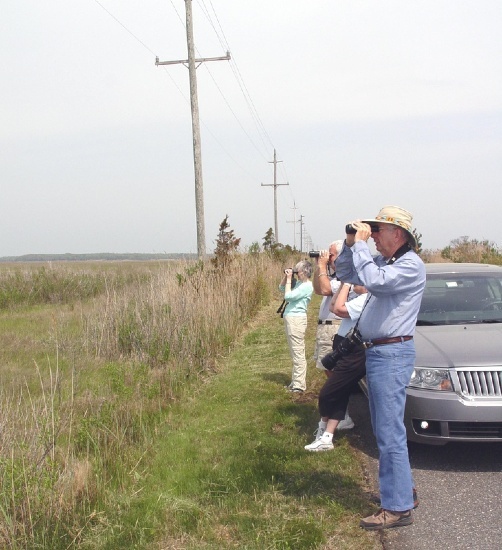 Last week, Mary Lou and I attended a birding Elderhostel at Cape May, New Jersey. We stayed at Little Egg Harbor, NJ with my brother and his wife for a few days before the program. This provided us the opportunity to bird in several nearby areas, including Estelle Manor State Park and the Brigantine (Forsythe) National Wildlife Refuge. We also visited Barnegat Inlet and walked the beach near the lighthouse. New Jersey’s oceanfront beaches are mostly open to the public. There are a few areas fenced off to protect nesting shorebirds, most notably the Piping Plover. There were several school buses full of kids who were picnicking and walking with their teachers in groups on the beach. I noticed one group approaching a pair of American Oystercatchers. The birds became agitated and performed distraction displays, a response that suggested that the children were invading their nesting territory. 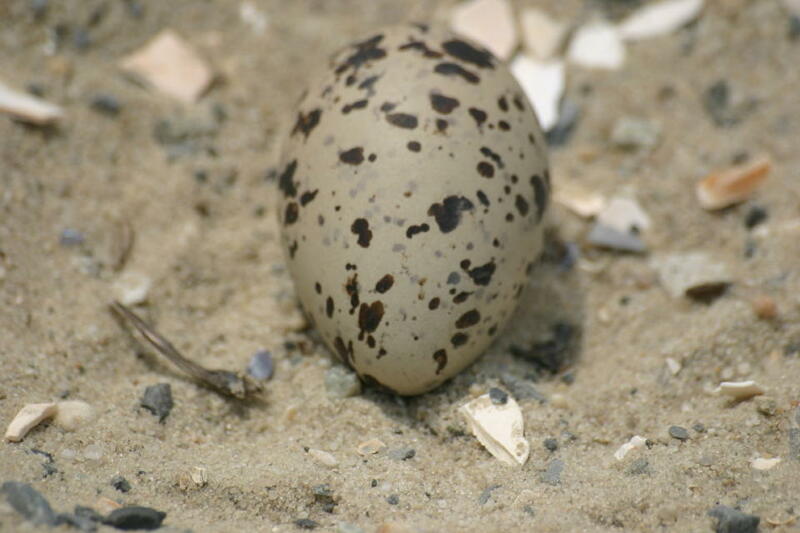 I walked over to the location, and by using the same “reverse psychology” that has helped me locate Killdeer nests (moving in a direction opposite to where the birds tried to lead me), I quickly found a single egg in a scooped depression in the middle of the beach just above the high tide mark. 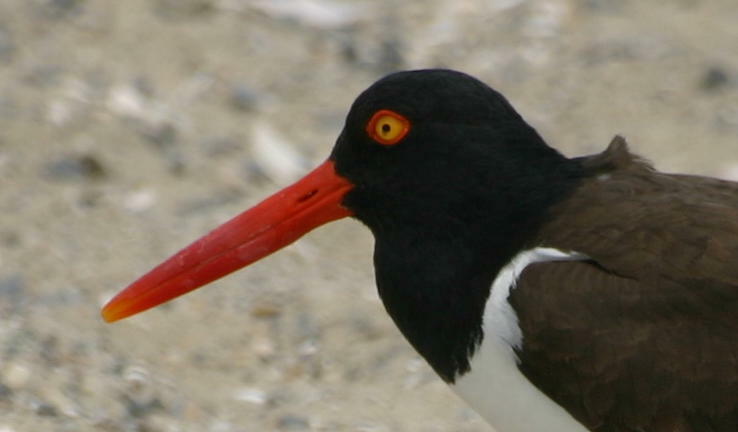 The Oystercatcher sports an outlandish bright orange bill and has yellow eyes encircled by red rings. Remarkably, its bill is flattened vertically to permit it to probe inside the partially opened shell of a bivalve and sever the strong adductor muscle. It then devours the flesh of the hapless shellfish, often “washing” it before swallowing. I photographed the birds and their egg, and quickly withdrew, but another large group of kids began walking right towards the nest. I intercepted them and informed their teacher, so they diverted their course to avoid the nest. There seemed to be no officials around to notify, so we departed feeling very pessimistic about the success of this nesting attempt. Early this March, a group of four Black Vultures congregated on our next door neighbor’s lawn, at the shore of our lake. They were tearing apart the dead body of a Muscovy Duck. Later in the day I took a look at the carcass, now little more than a bunch af feathers and cleanly picked bones. I did not think much of it until a few days later, when I noticed that tough old “Pato El Presidente,” the alpha drake who ruled our section of the lake’s shore, was missing. See previous blog entry about him here. During the next couple of weeks there were many skirmishes between rival drakes, with two particular ones, a pure white specimen whom I named Whitey, and Whitewing (pictured, previously an incessant rival of El Presidente), appearing to have the upper hand. Discord among the ducks continued well into April. Whitey appeared to emerge as the new boss of our piece of the lake. Previously, Whitey’s territory centered on a home diagonally across from us, where the owner regularly fed the ducks and pigeons. This must be the most prized territory on the lake, so perhaps Whitey was displaced to a lower position in the Muscovy heirarchy. This spring, the third we have spent here in South Florida, we have so far seen no Muscovy Duck chicks on our 10 acre lake. Usually, by now there would be between 3-10 broods in various stages of growth. During March and April I found four nests on ours and neighboring properties with eggs that failed to hatch. One nest just off our patio contained 14 eggs and the hen incubated them for well over a month before abandoning them, all intact.Could this be due to the instability of the social order that was caused by the loss of El Presidente? I wonder whether this is unique to our lake, or has anyone else noticed it? Could the nesting failure be related to the record drought conditions that have brought our lake level down by almost three feet? With the low rainfall, is it possible that the pesticides from residential lawns, or the herbicides that the South Broward Drainage District regularly sprays along the lake margin, might have become more concentrated and thus have an unexpected anti-fertility effect? Are other local species experiencing similar problems? True, I am not concerned about the Muscovy population, but want to be reassured that this is not an indicator of any larger problem. After all, the web of life encompasses all of us.